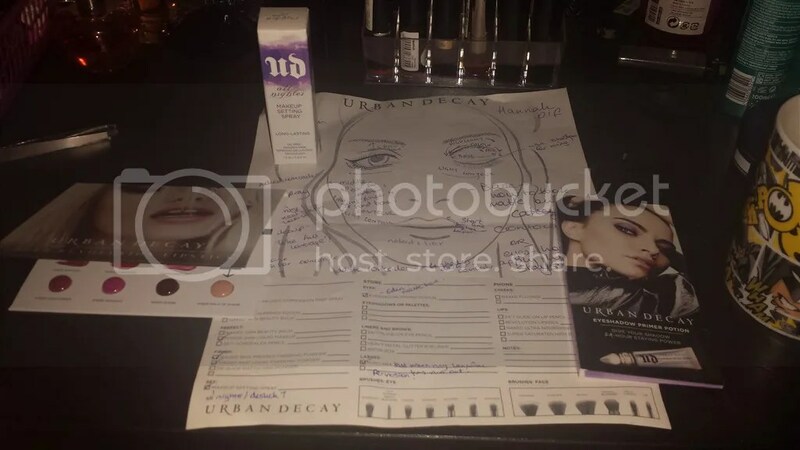 So I mentioned to you earlier in the week that I’d managed to grab a couple of tickets to a Make Up Masterclass with Urban Decay’s national MUA, Caron Keane, at the House of Fraser in High Wycombe. They cost five pounds, which would be redeemable against any purchase on the night. My mum and I decided to make a day of it, going to see the new Disney Cinderella (AMAZING, beautiful film. GO SEE IT NOW!) and then heading to the masterclass, before finishing with a meal at Zizzi’s afterwards. I applied my base with my blending sponge, as I have been for ages. But when I tried to put a bit more coverage on, it just seemed to wipe off what I’d already buffed in! So I switched to my Real Techniques buffing brush, and that just seemed to cover my face in brush strokes! I buffed and buffed in circular motions until I thought my arm would fall off and decided enough was enough and just used a great big fluffy brush to powder the crap out of my face with my usual Soap & Glory One Heck of a Blot. Of course, it caked today. Of course it caked. It’s like the gods of Urban Decay wanted me to be frustrated with my make up so I’d buy a load of theirs later (which sort of worked, but I was very restrained!). 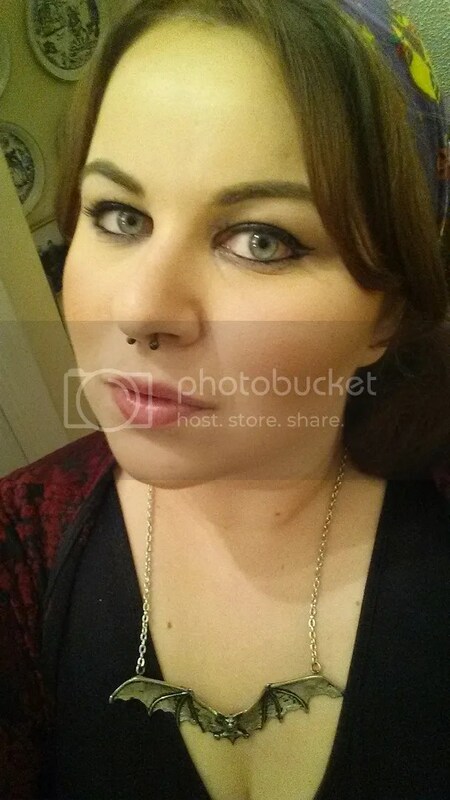 Then my contour looked ridiculous and wouldn’t blend. Then my eyeshadow wouldn’t blend properly either, and my liner wouldn’t work. Then I gave myself an unwanted and uneven Scouse brow. Then my lips wouldn’t go on straight. You know the sort of day I mean? I’m sure you do. Anyway, with the assurance from my mum that ‘you’re too critical, it looks fine’ we got to town and sat down to see the film. It was just amazing, magical and beautiful and I would go and see it again in a heartbeat. Only, I cried at certain bits throughout (in the beginning and sort of nearish the end, you’ll know if you see it). So my eyeliner went for a wander and I had to redo it quickly before we headed for House of Fraser and the main event. The lovely Jemma met us at the counter, and she invited us to follow her upstairs to the Cafe Zest, where the master class was taking place. There was Caron Keane and a whole plethora of beautiful, shiny, sparkly Urban Decay products waiting for us. So my mum and I nabbed a seat right in the middle (as you do), right in front of where the model was sitting, and were promptly offered a glass of (free!) sparkly pink wine (yes please!) 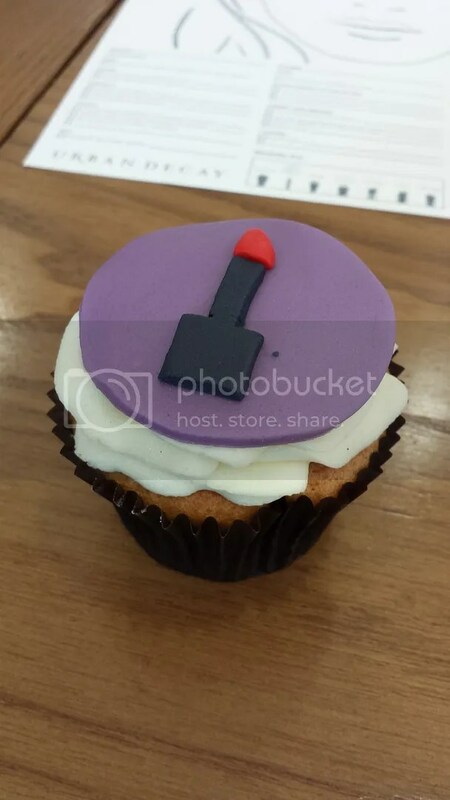 and a specially made Urban Decay cupcake- I am informed these were made by a girl from the YSL counter. Girl from the YSL counter, you make good cupcake! 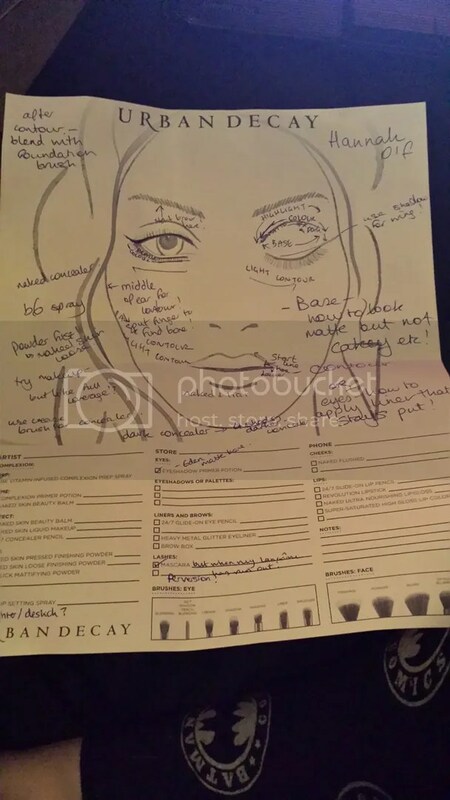 The other thing we did, whilst munching on our cakes and sipping our wine, was filling out a little customer survey dealio and also writing down whatever we wanted to learn from the masterclass (plus our names) on a little face chart. As you can see, mine promptly became my note-taking sheet during the masterclass! What I thought was brilliant was that the sheets were all collected in once we had written on them, and once we were all present and the masterclass had started, Caron went through them and noted what we’d all like to learn, and then asked us individually a little bit more about specifics. So I wanted to learn about how to achieve a matte but not cakey base, how to contour properly (more extreme, please!) and how to apply liner that stays put, whereas my mum wanted to know about base and skincare and how to fill in and shape your brows. This meant that as she was putting together the model’s makeup look, Caron could focus on what we all wanted to know. Rather fittingly, we were all after the same thing! The finished look was amazing, and I found it so interesting to watch. I learnt so much about application and little tricks and picked up a tip for applying a long lasting, non-cakey base- forgo a primer, for a powder! Yes, if you have the right sort of loose powder, and apply it before your foundation, it will help the foundation adhere to your skin better and last for longer! Finish with a light dusting of the same loose powder or a dusting of a powder foundation depending on the finish and coverage you want and voi la! Base that stays put and does not cake! Once Caron had finished, we all made our way back downstairs to the counter where we could try out anything we liked the look of with the help of the lovely counter girls (Jemma, Cintia and Leila– you’ll be seeing much more of me!) and could ask Caron any other questions we had about anything and everything Urban Decay or make up related. My mum learnt exactly how to do her eyebrows, and Jemma helped me try out the base and contour Caron had done for myself. Not gonna lie, I kinda fell in love with it! She matched me to the Naked Light loose powder, the Naked Skin concealer in Light Warm and the Naked Skin Weightless liquid foundation in shade 1.0. Even though I didn’t have this put on me until about quarter to eight in the evening, we then went to eat in a hot restaurant and I didn’t take it off until well past midnight and it was absolutely perfect to the bitter end. I don’t know how much of that was Jemma’s precise application and how much was the product itself, but I was convinced and I bought a few things and instantly put the foundation on my wishlist! 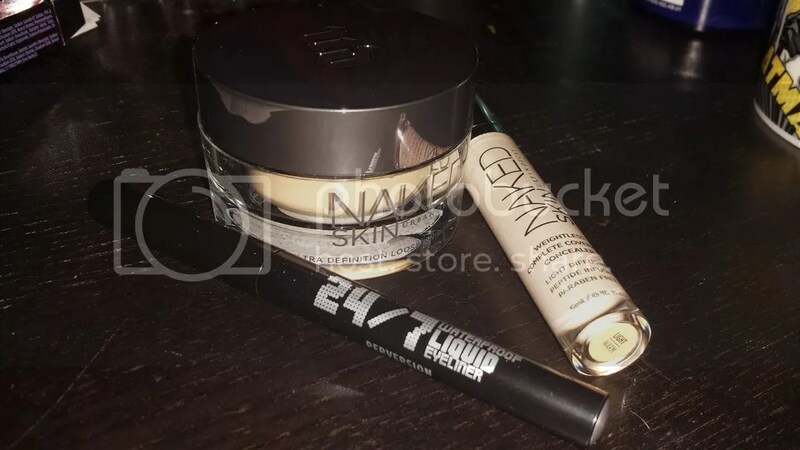 I bought the loose powder and concealer Jemma used on me and then also a 24/7 Waterproof Liquid Eyeliner in Perversion, because Urban Decay’s Perversion shade is the blackest eyeliner I’ve ever used! I’ve also put their Perversion mascara onto my wishlist to purchase when my Lancome Hypnose Drama is used up! My mum bought a few things also, including a bottle of their b6 serum spray which I am most definitely going to share with her! We also got a goody bag, which contained samples of the Sheer Revolution lipsticks, their eye Primer Potions and a mini bottle of their All Nighter setting spray- rather awesome, as I needed a new setting spray! All in all, it was a fantastic experience and I learnt so much! We also booked in for a special preview of a product launching this summer- I have a wonderful feeling it might be their new line of blushes! I would definitely recommend going to a masterclass like this one, and it has only made my addiction to Urban Decay worse… I must stop buying so much drugstore make up and start investing in higher quality items! Also, as mentioned before, here is a quick haul I did from Attitude Clothing. 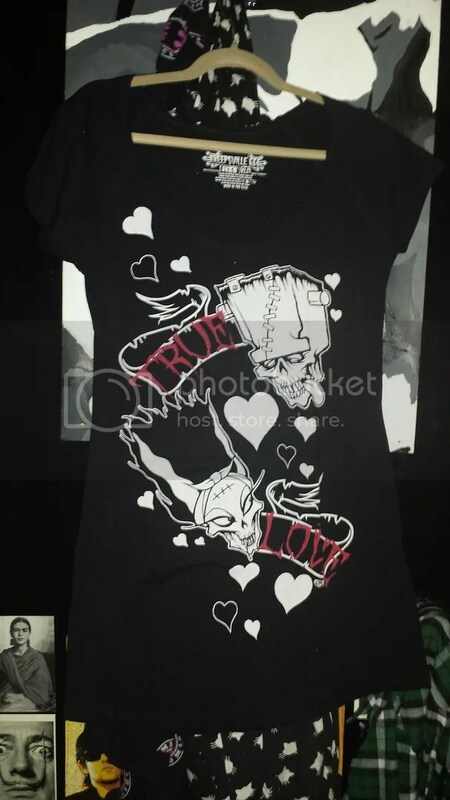 Attitude are an online retailer of alternative clothes and accessories and I used to love them when I was younger. 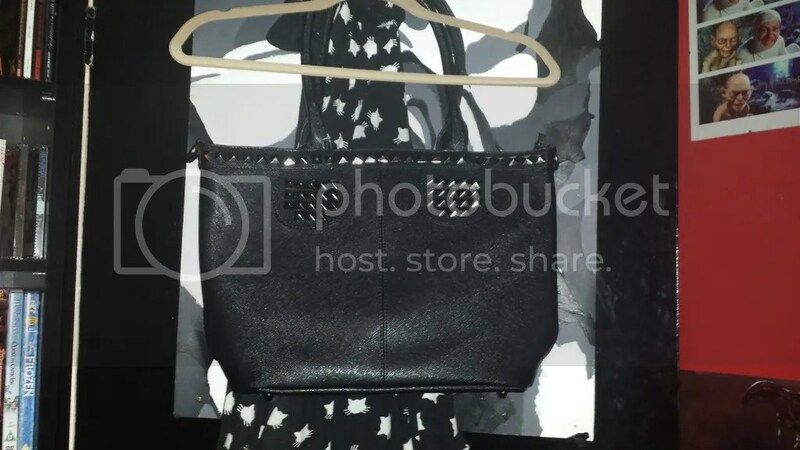 I haven’t however bought anything from them for a long time, but needed a new bag so decided to buy one from them and also picked up a new Kreepsville 666 dress! Here’s the bag- it’s amazing! It’s got three compartments plus a mini zipped one inside, came with a detachable strap and is a really nice quality. The studs don’t feel to flimsy and as my mum said, it’s overall effect is ‘quite subtle’. I’ve asked for a slightly less subtle bag from Banned Apparel for my birthday, though, so we’ll see! And this is my new dress! I love Kreepsville 666, they’re definitely one of my favourite gothy/alternative brands. 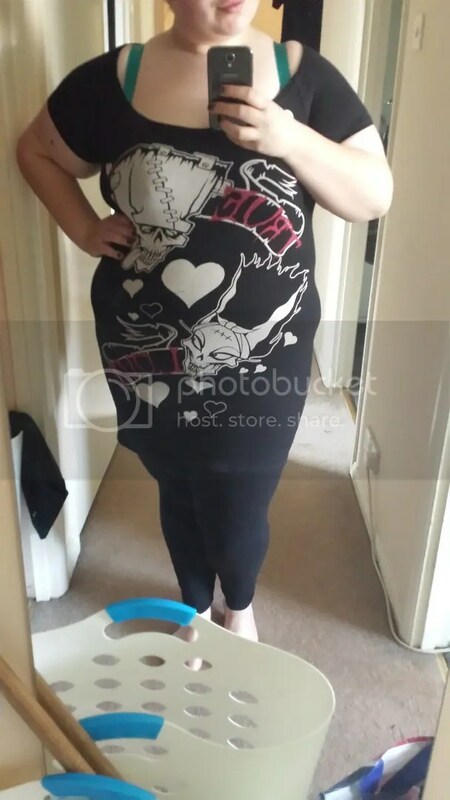 For some reason, I think I went a bit mad and ordered this dress in a size up from the other things I own! It doesn’t make too much of a difference now- the fit is obviously looser and it seems longer, but hopefully it won’t matter too much when I keep losing weight. 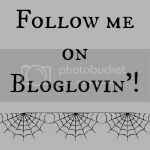 This is what it looks like on- I love the kitschy, cute Frankenstein and Bride print. The Bride of Frankenstein is one of my favourite films so I instantly fell in love. So there you have it! Have you ever been to a make up masterclass before? 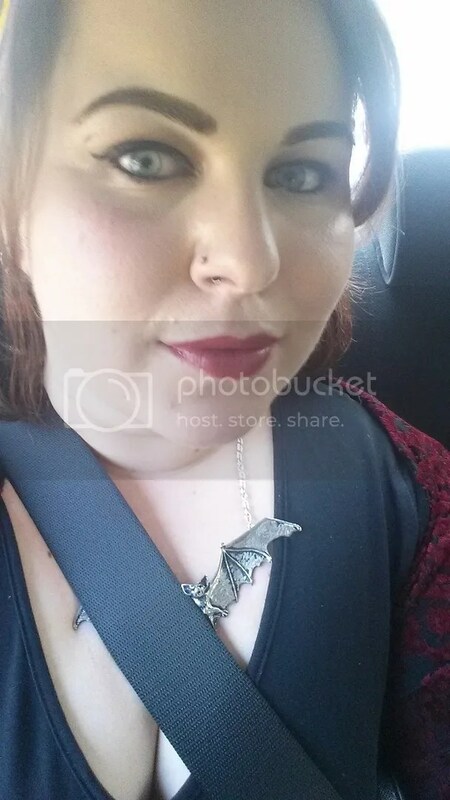 This entry was posted in Beauty, Lifestyle, Makeup and tagged Attitude Clothing, Caron Keane, haul, House of Fraser, Kreepsville 666, Make Up Masterclass, makeup, Urban Decay. Bookmark the permalink.